Listen guys, I'm about to save you a whole lot of time here. Let me start by saying that I absolutely love this series. I don't care that it's repetitive in a sense of same theme different characters, I think it's a great series on a whole. This season starts off like that and gives you a slight 3rd season vibe where they introduce a new character and hell girl backstory subplot. All in all, this part was definitely interesting and I was really excited to see where they were gonna go with this. Unfortunately this new plot lasts for about 6 episodes. It was resolved quickly and half-assedly (for lack of a better term), and then they said, "You know what was great? That time we did that thing from past season." And from then on they lost me. I may like repetitive themes but I do not like recap episodes, they are actually a waste of time. 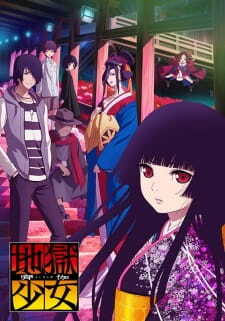 I will be honest and blunt here season 4 of Jigoku Shoujo is a waste of time and it’s not like the previous 3 seasons that had an actual story and character development.The lack of originality is missing, the poor writing is all over the place and the enjoyment is zero.Also if you are wondering if this has any connection with the previous season you are wrong, it has nothing to do with the whole series at all it’s just a 12 episode cour waste of money and time. The first 6 episodes are just cheap drama that turns into edgy stuff and it makes you wonder what on earth happened to the whole story and series in this anime and the last 6 episodes are a recap of what you already have seen from the other seasons. Well one thing for sure they wanted to promote their dvd sells so they wasted a lot of time on this season. The story is not interesting at all, as usual you have the episodic plot where someone sends to hell a person and the reasons why she must be punished. I don’t mind this at all my only problem is that the horror atmosphere was ruined and turned into and edgy comedy show. I will be honest I had a good laugh at that family arc where everybody hated someone. The characters actions where so damn funny that the emotional atmosphere was ruined and the way they beat up each other and scream was so edgy that made me almost drop this anime.Also the main story is exactly the same thing from season 3 but they changed the character art style and the story of the girl who will succed as Jigoku Shoujo to make it look original. Muh originality…. What I like from this anime was Ai Ennma who always maintains her character strong and the opening song. The animation and ost are great and in my opinion wasted on this season. If you are looking for great things like the other seasons provided look somewhere else this is not worth your time , the ending lacks originality and if you don’t want to ruin your opinion about jigoku shoujo don’t watch this. This anime is the fourth and most likely final season of the Hell Girl animated series which began airing in 2005. The Hell Girl (Jigoku Shoujo) series can be considered a collection of short stories that never span for longer than one episode, with one exception in which it is divided in two parts, where different characters are involved in a number of events linked to the Hell Correspondence (Jigoku Tsuushin) a group of supernatural entities that have been tasked with providing humans with a "service" of sorts that allows them to send people to hell, provided that they have accepted the conditions of the contract that is formed between them and Enma Ai, who is a mysterious, emotionless girl playing the role of the protagonist in every season. The premise remains unchanged but there's always a deuteragonist, a character whose story takes place in a different context which develops independently or even tangentially from each of the stories, yet they invariably find themselves sharing a unique kind of relationship with Enma Ai. In Yoi no Togi, we are presented with one of those new characters, a nameless girl wearing a green dress, whose existence appears to be similar to that of Enma Ai and as such is infered to be that of a supernatural entity in the human world. In all seasons, the different short stories deal with an assorted variety of dark themes such as dysfunctional families, abusive relationships, physical and psychological torture, deep resentment and sentimental conflicts which cause major distress to those who are subject to them, but always with a focus on the pain that builds up and festers a desperate need for an individual to accept the eradication of another person as the solution to an inescapable conflict even on the face of the prospect of spending an eternity in 'Hell', which is then accepted as a more desirable fate than enduring the present state of affairs. In that sense, the only common underlying theme to all of the stories appears to be that tragic fate which awaits both the victim and the aggresor and the internalization of the concept of 'Hell' as a state of endless damnation and suffering of the soul, and with little to no mention of a 'Heaven' throughout the series it becomes evident that there's an interest on the part of the Hell Correspondence (and Ai herself especially) for these people to actively choose hell as the only alternative instead of finding a different (if any) solution to the conflict, as there are only exceptional cases where sending someone to hell was not the ultimate and decisive goal set by either the victim or Enma Ai's team even when the option existed for them to solve the conflict without sending anyone to hell. Now if you'd ask me, I'd say the stories themselves might be the best part of the entire show, they are like urban legends, things that may or may not have happened, but such as all urban legends, you just know it has that bit of truth somewhere in there, and makes you wonder what would have actually happened without the added supernatural aspect of the Hell Correspondence as the cop-out method to reach that much needed "closure" and solve the problems that its clients face, those times you feel the need to take a side, and decide for yourself which one is in the right, it gives you that sense of foreboding that resembles the expectations of a human drama as you follow it closely to the end, and even when you know that the only possible conclusion is the obvious one (i.e someone will go to hell), it's often never as simple as agreeing that what the victim did was the right thing, simply for the fact that he/she was being victimized or made to endure a living hell, there's the anticipation and realization that the outcome isn't going to be exactly what you were expecting, and the theoretical contrast between the concept of hell and whether life can be worse or the same. But at the same time, there are those episodes where stories are just barely realistic, and or, loosely based on existing stories that are commonplace in the horror and mystery lore even when they are not carbon copies, episode 13 and 17 from season one come to mind, and don't seem to serve much purpouse other than filling a time slot, this might be a problem for some but as I see it, the only people that would enjoy Hell Girl would be those willing to sit through a slow paced development, the dark themes alone demand of the viewer a certain measure of contemplation and deep thought and there's barely any room for entertainment sometimes even when the third season tried to be a bit less serious on the punishment sequences and gave Ai a bit of a (sick) humor sense mixed with some strange "fanservice" bits, you can forget about that in Yoi no Togi though, this one went back to the first season in that department. Incidentally, I feel that the themes pertaining the nature of hell itself versus life in the living world once again becomes a central theme in Yoi no Togi, which I believe fell somewhat short on its execution compared to the other seasons, maybe has something to do with the time they actually dedicated to developing the character of Michiru, who went from nameless amnesiac girl, to what she would become in what? 3-4 episodes? now this is probably not a bad thing, but taking half a cour to build up the character and their motives and then following with an abrupt conclusion wasn't probably the best way to come back after 3 seasons with almost 25 episodes each, though in all honesty I'm biased for Hajime's story so I could be setting the bar too high here. Animation on the other hand, has never been exceptionally great, but for this type of work the visuals are not the main attraction, so I can forgive that much, even then in Yoi no Togi, there has been a significant improvement from the type of animation we are used to, looking back to the first season, you can see how the animation team in studio Deen has moved up from the early 2000 digital animation techniques to the current animation programs with the typical crisp lineart you see in 2012 and up anime, and yet the character designs remain consistent with the previous seasons which is already a lot considering it's been well over 10 years. All things considered, I don't feel disappointed revisiting this series in what will probably be the last season, I'm glad to be met with the same lovely Hell Girl I remember from a while back, but nostalgia aside, I feel this type of work being preserved as it was with little to no changes is probably for the best, a rare hybrid between a slice of life and a horror supernatural drama that never gets old, a timeless anthology of misery and tragedy. Overall good story, and a great leading character of Enma Ai, but the storyline for the series is too repetitive. I'm currently trying to watch this, but I just can't seem to get to it. I'm not too sure why to be fair, maybe because I know that all that can be expected is what was already seen in the first and second season. This means, that we will see Ai Enma taking up on requests from people, who want to send someone to hell. If perhaps we see Yuzuki become the real Hell Girl, instead of just her temporary replacement, to give a different twist to the storyline then I would be tempted to finish it. So far though I don't think I will bother finishing the whole show.